This post is likely to be the most controversial I have ever written; given the intensity of the Star Wars fandom. But I am not a part of that fandom. I saw and enjoyed all three of the original Star Wars movies as they came out; and I rewatched them on video and DVD; but the movies never communicated any special depths to me. I never developed the special affection I had for the first four Dr Who incarnations; or for Blade Runner. So - the most I expect from a Star Wars move is entertainment with a good heart. That was the attitude with which I approached three recent Star Wars movies. All had been rather negatively reviewed by most of the people I read - and I expected not to like them and to give-up part way through; but in fact I watched them all to the end, which means I found them sufficiently entertaining. The best was Rogue One; which I have now rewatched twice. It is worth 4 stars (out of five); entertaining and a bit more; very strong movie albeit not quite first rate (spun-out climax). The Force Awakens was less good; but still worth watching - I gave it 4 stars on first view, but perhaps it declines to 3 stars on re-watching, as its flaws become more intrusive (and as its inconsistencies do not get explained by the next movie). However, to my surprise, I found Last Jedi entertaining despite its many and obvious flaws and incompetences. So I watched it through to the end although it is - as story telling - a contrived shambles. The main plot and characters, their (non-)motivations and improbabilities and competences are clearly nonsense - the movie as a whole is nonsense! So, what kept me going? It was the abundance of details that I enjoyed. 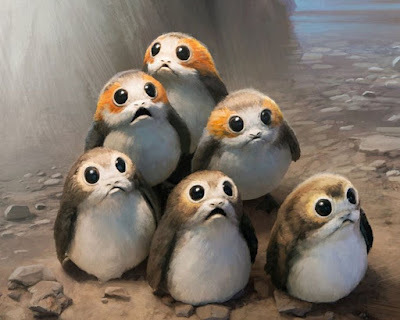 Perhaps especially the weird animals and creatures, and most especially the small and cute penguin-like ones ('porgs' - see above). But also the big, loping, Anglo-Nubian goat-eared racers. The little drunken Victorian gentleman-creature guy in the casino, trying to put coins into R2D2 under the impression he was a slot machine... The Toad-as-Washerwoman (from Wind in the Willows) creatures that inhabited Luke's Island - and I also liked the Island itself; modelled on the beehive huts of Irish hermit monks of the dark ages. Micro-stuff like that. I also appreciated the acting, or maybe just the face-acting, of Adam Driver as Kylo Ren - despite (again that word!) so many suboptimal lines and situations, he is strangely compelling; he has star quality (unlike several other cast members...). But surely Dislike Of The Last Jedi is one of the three fundamental pillars of neoreaction, along with Game and Weightlifting? I dislike Disney Star Wars, but probably less so for the clumsy Leftist political allegory and moreso because the worldbuilding of Star Wars movies was always sloppy and inconsistent, and the newest movies are sloppier yet, and I can't really get into stories like that. So I was actually turned off well before anything was known about Last Jedi. For what it's worth, I have enjoyed some 'SJW' and transhumanist fiction -- taking the authors' unsubtly telegraphed opinions as-they-may-be -- where the author had put much more effort and belief into the subcreated world and created some compelling concepts or characters. However, that doesn't necessarily translate into a recommendation for other people. Most such compelling fiction was independent or fan-works rather than anything produced or published by a large institution. "Dislike Of The Last Jedi is one of the three fundamental pillars of neoreaction, along with Game and Weightlifting?" I've watched and enjoyed the original trilogy many times, though not at all recently. I also thoroughly enjoyed The Phantom Menace, finding it entertaining and very quotable -- though its appeal is essentially as a "so bad it's good" movie along the lines of Curse of the Komodo. I watched the other two prequels when they came out, too, but found them so forgettable that I can't even remember the title of either film and can't be bothered to look them up. So far I haven't been able to muster enough interest to watch any of the new-new installments. @William - I didn't get through the Phantom Menace or the other prequels - just dull. In my family, my choice is that somebody or another will be watching a movie - and do I join them? I only seldom make an proactive choice to watch something specific. I agree with you about Rogue One. It was my favourite film of the whole franchise. It had a concentration and intensity which lifted it above the others, and the scene with Darth Vader is quite scary.